Valerio was one of the Pirates’ more prominent international signings in 2013. He’s considered an outstanding defensive shortstop, with a bat that’s behind his glove. Valerio had a solid debut, showing the expected defensive potential and holding his own with the bat. For a 17-year-old, his numbers weren’t bad, and he made decent contact and showed a little gap power. Valerio was the regular shortstop in the GCL. At the plate, he had largely the same season as the year before, with a higher K rate. He again showed some gap power. He didn’t look overmatched at bat and may simply need to get stronger. He showed the range, hands and arm to stay at short. The Pirates sent Valerio to Bristol, either because they didn’t think he was ready for Morgantown or because they drafted Stephen Alemais, or both. He continued to show promising defensive ability while hitting about the same as the previous year. He did hit very well late in the season, going 17-for-45 (.378) over his last eleven games. Unlike a lot of switch hitters, he was better hitting right-handed, with a 310/341/357 line against LHPs and 216/240/305 against RHPs. He hit better right-handed in 2015 as well, although not by as much of a margin. Valerio was slated to split the middle infield duties at West Virginia with Stephen Alemais. As it turned out, the two were seldom on the field at the same time. Valerio opened the season in extended spring training due to a broken hand he suffered from being hit by a pitch. He wasn’t able to play until mid-May, and even after he returned he went out again at later times due to an ankle injury and to being hit in the face by a throw. In between injuries, Valerio had a breakout season at the plate. He still drew almost no walks, but he began hitter for good power. Valerio was eligible for the Rule 5 draft, but wasn’t selected. 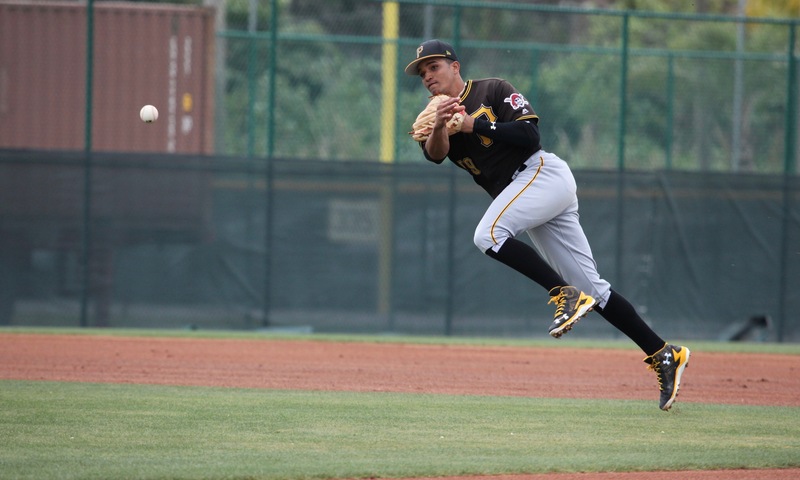 He spent the season as Bradenton’s regular shortstop and didn’t build on his progress from the previous year. He was very impatient and seldom got on base, while also seeing an increase in his K rate. He had only one month with an OPS above .635. His defense remained very strong. Valerio took a step back in 2018. He was again passed over in the Rule 5 draft and will return to Bradenton rather than moving up to Altoona. With Oneil Cruz at short, Valerio will play second. July 3, 2013: Signed by the Pittsburgh Pirates as an international free agent.